I had the opportunity last week to attend the U.S. Chamber’s annual Aviation Summit. “Aviation” in the title is really a misnomer. Despite the fact the Chamber has member companies with corporate flight departments, and even a wide array of other aviation businesses, make no mistake about it — this was an airline conference. The summit’s lack of balance was startling; this was a vehicle for airlines to get their message out and other viewpoints need not apply. Comfortable in what was clearly an enabling setting, airline executives felt empowered to say what they really think. The leaders of the so-called low cost carriers were in lockstep about the dangers posed by four airlines with 80-percent domestic market share. Through their dialogue, they invited us to peak behind the curtain for a look at the impact of global joint ventures, noting for example three mega-alliances controlling 87 percent of the transatlantic market. They called upon the Department of Transportation to revisit these anti-trust waivers and immunized joint ventures…..and in the next breath they called upon Congress to adopt the Shuster proposal to create an airline dominated air traffic control corporation. This is a demonstration of the old political adage, “where you are is where you sit.” Market concentration, it appears, is dangerous….unless of course you are part of it. This inability to either see or understand other perspectives is disappointing from people who are seemingly aware of the dangers created by market concentration. Even if we all saw creating an air traffic control corporation as a good idea, which we don’t, why would aviation businesses willingly sign up for a proposal that leaves their future costs to be determined by airlines? Worse are the half-statements that come along with addresses of these sort. For example, we were told airlines believe in a user fee-funded corporation so much they are willing to write their own checks to the corporation for the air traffic services they use. How altruistic. Except of course the real cost will be borne by the customer and the corporation proposal neatly removes accountability for those costs from a consumer’s direct scrutiny — let alone the costs the airlines will attempt to shift to general aviation. Other whoppers rehashed in front of a largely adoring crowd included the suggestion that air traffic controllers are using 1950’s technology, or that 60 countries currently operating corporatized systems are in some way more efficient or safer than ours. Airlines also tried to dispel the notion they don’t want to run the corporation by noting the composition of the air traffic control board was changed late in the House committee process with the addition of two more seats for general aviation, bringing GA to the same number of seats as the airlines. While no doubt equal in number, it’s arguable those seats are not equal in weight. The corporation CEO, who also holds a board vote, will undoubtedly feel the pressure of the four votes that represent the overwhelming amount of corporation funding. In addition, this is not a proposal that is yet set in stone. Neatly forgotten by these airline leaders during the conference, their complaint to Congress that the original proposal already lacked a sufficient number of airline stakeholders, particularly given the representation from general aviation — stakeholders that in their view pay next to nothing. We should not expect the airlines to give up on their attempts to “perfect” the board’s composition. I report all this to remind you that despite some press reports, the airline industry is not giving up. Between now and July 15th (when the current FAA reauthorization again expires) we must be vigilant and engaged with our elected lawmakers if we are to withstand the imposition of the airline worldview on consumers and general aviation. On Monday, the Administration submitted to Congress a $4 trillion budget proposal for FY2016 that includes $15.84 billion for the FAA. 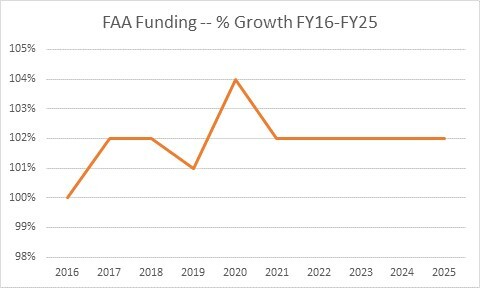 In context with the President’s other discretionary spending proposals, the increases in funding for FAA operations, modernization and research will be difficult to sustain through the budget process unless Congress and the President reach a new agreement on overall discretionary spending levels. *Proposal assumes increase in the Passenger Facility Charge (PFC) from $4.50 to $8.00 and focusing remaining funds on smaller commercial and GA airports. 85 additional FTEs requested for additional flight standards safety inspectors and aircraft certification engineers. $845m for NextGen capital investments. Maintains $6m in funding for alternative GA fuels. Largest proposed increases are in the Flightdeck/Maintenance/System Integration Human Factors program ($3.9m) and weather program ($3.4m). While an overall reduction, the Administration believes that limiting the use of AIP to smaller commercial service and GA airports would represent an increase in available funds in those categories. The GAO estimates increasing the Passenger Facility Charge from $4.50 to $8.00 will generate approximately $2.4b in additional funding to the larger airports. The Administration has finally dropped a proposal to derive part of its budget from a $100 per flight surcharge on general aviation flights. The Administration has once again proposed to lengthen the depreciation schedule for business aircraft from five years to seven years. The Administration is also proposing to increase the capital gains rate from 25% to 28%. Because of the proposed shift in AIP spending, it is not a straightforward exercise to assess the proposed FAA budget increase in the context of other domestic discretionary spending proposals. However, the proposed increases for operations, F&E and RE&D are 3.5% above current levels. This is in contrast to the Administration’s total proposed domestic discretionary funding increase of 7%. While the additional proposed spending for FY2016 in F&E and RE&D are welcome, it does not appear those increases will be sustained in the long-term. 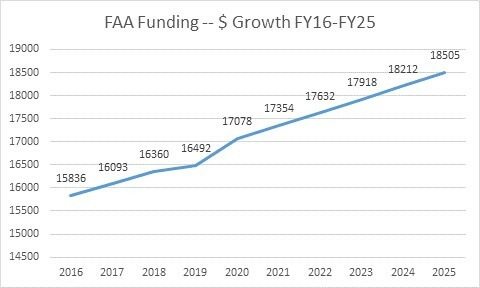 The Administration’s out-year projections of FAA funding average approximately 2% growth through 2025 (see charts below). AIP would be sustained at the $2.9b level until FY2020 when it is projected to rise to $3.35b per year through FY2025. The proposed 10% increase in F&E funding for FY2016 actually increases out-year funding for modernization by $200m annually above the levels the agency reported to Congress just last summer in its capital development proposal. Propose new user fees and taxes to offset any proposed spending increases. The President’s budget proposal essentially uses elements of choices #2 &#3. His overall discretionary spending numbers are 7% above the caps and the overall proposed budget would still deficit spend by $474 billion. The ball is now in Congress’ court. It can live within the discretionary caps, which limit overall funding increases to less than one percent, and develop appropriations bills that are essentially flat. This would be difficult for many agencies to absorb. For example, given increased annual costs in categories such as FAA operations, a flat budget will essentially represent a cut to other parts of the FAA budget. However, the President’s offer of increased defense discretionary spending may be intriguing to many congressional Republicans and could serve as the basis for a compromise similar to the Ryan-Murray agreement in 2013 when the discretionary caps were adjusted using various budgetary slight-of-hands to offset the increased funding. One of the things I have noticed since returning to aviation is the use of the term “sequestration,” with its implication that at some point this year or next there could be another mindless, across-the-board cut applied to the FAA budget. The good news is that thanks to the agreement reached in late 2013 between then House and Senate Budget Committee Chairmen Paul Ryan and Patty Murray and President Obama, we know that the application of an across-the-board cut to the FAA budget will not occur this year and is unlikely in future years. We also know the overall budget numbers that lawmakers will be working from this year absent a change in law. However, that doesn’t make the FAA’s budget picture necessarily brighter. The Administration will release its FY2016 budget proposal next Monday, so now is a good time to review the FAA’s budget and what we should be looking for on budget day. To understand the FAA’s budget situation we have to first understand the overall federal spending. The FAA’s annual budget of approximately $16 billion is part of a category of spending known as discretionary spending. In other words, Congress must annually fund discretionary programs through the passage of 12 appropriations bills. 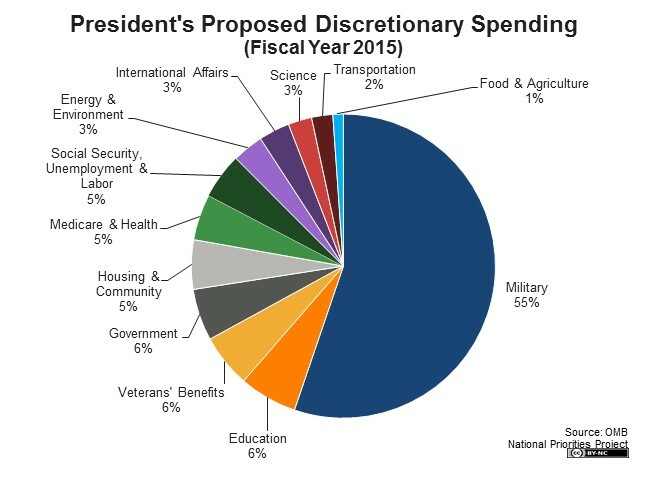 However, as we see in the chart below, discretionary spending is a small part of overall government spending. 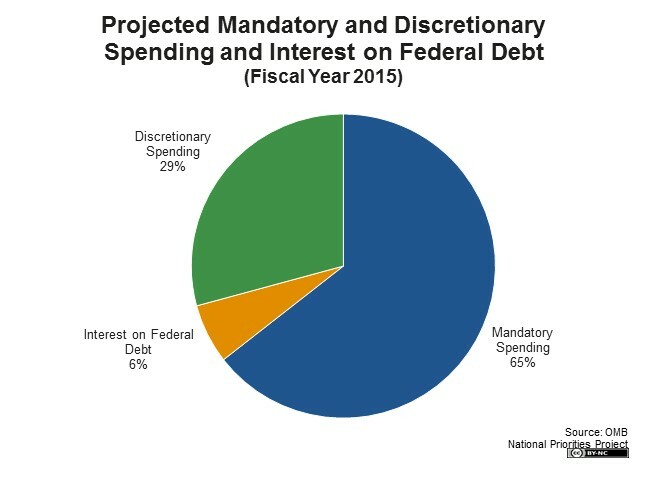 Mandatory spending programs are determined by eligibility rules rather than the annual appropriations process. As you saw above, these programs represent the largest portion of annual federal spending. Examples of mandatory spending include Social Security, Medicare, Medicaid, and food stamps. Breaking discretionary spending down further, we see that over half of all discretionary spending is devoted to national defense. As a result, the FAA competes for resources against a number of other worthy causes for a slice of the federal spending pie that represents only 13% of all government spending. So the budget fights between Congress and the President of the last four years — fights that have resulted in government shutdowns and across-the-board program cuts — have largely been directed at approximately one-third of annual federal funding. 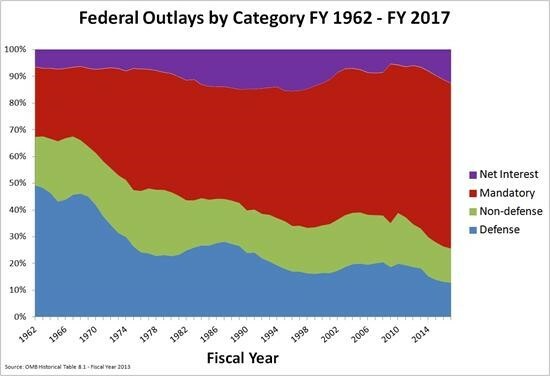 Worse, as you see below, discretionary spending has been steadily shrinking and will continue to shrink because mandatory spending is the real driver of annual budget deficits and growing debt. The Congressional Budget Office (CBO) released a report this week noting that while an improved economy and reduced spending has reduced the size of annual budget deficits, they will begin to climb again starting in 2019, driven by the healthcare and other retirement costs of the baby-boom generation. The CBO also noted that federal debt held by the public will amount to 74 percent of GDP at the end of this fiscal year—more than twice what it was at the end of 2007 and higher than in any year since 1950 and that by 2025 it will rise to nearly 79 percent of GDP. So what does this all mean? First, feel free to be less than impressed by those who brag about controlling federal spending, as some budgetary wits have nicknamed them the “One-Third Serious Caucus.” To really control government spending you have to, like Willie Sutton, go where the money is – mandatory spending. In fairness to lawmakers, it is political suicide to reduce the benefits of mandatory spending programs absent the kind of grand budget deal that requires Congressional members from both parties and the President to all hold hands and jump in together. A 2011 agreement between Congress and the President to address the seemingly endless disputes about federal spending and the debt limit resulted in the creation of a congressional “Super Committee” to develop a plan to control spending through savings in discretionary and mandatory spending and changes to revenue policy (i.e. taxes). A failure to reach agreement would trigger a “sequester” on the current and future federal discretionary spending levels contained in the agreement. It was thought at the time that the possibility of draconian cuts to both defense and non-defense discretionary spending would motivate lawmakers from both parties to reach agreement. So of course lawmakers could not reach agreement, and by March of 2013 the sequester was triggered that cut part of the FAA’s funding mid-way through the fiscal year. Source: OMB, Budget for Fiscal Year 2015, The Budget, Table S-10 and CBO, The Budget and Economic Outlook: 2014 to 2024, February 2014, Box 1-1. So when you hear someone express concern about “sequester spending levels,” they are referring to the numbers above, not the possibility of across-the- board spending cuts. The question of whether discretionary spending is sustainable at the sequester levels was discussed at a recent event at the Brookings Institution. Opinions ranged from doable in the short-term to the possibility that, similar to the Ryan-Murray Agreement of 2013, Congress could once again “game the caps.” There was also discussion about whether lawmakers would attempt to stay within the overall discretionary cap but move some portion of non-defense discretionary spending to defense, something that would exacerbate the FAA’s budget challenge. The President will submit his budget proposal to Congress on Monday, February 2nd, marking the start of another part of the annual congressional calendar, the development of the FY2016 budget. As we see above, the Ryan-Murray budget deal of 2013 was a bridge of increased discretionary funding for FY2014 and FY2015 to approach the cap level on discretionary spending for FY2016 (including the FAA’s budget). For next year it is almost the same level as the current year. This would make a major funding increase for the FAA unlikely absent a decision to cut other discretionary spending. These choices will not only impact the FAA but also tell us a great deal about how smoothly we can expect the budget process to unfold this year. Finally, we will also be watching to see if the administration proposal will continue to contain proposals impacting GA in a negative way including user fees, cuts to contract tower funding and changes to the aircraft depreciation schedule. The mid-term elections are concluded, the people have spoken, and Congress returned on Wednesday from two months of campaigning for a lame duck session that is expected to end in mid-December. For those of you unfamiliar with the term, “lame duck session” is the nickname for a session of Congress that follows an election and includes lawmakers who will not be members of the next Congress, having decided to retire or were defeated. Initially, it was thought that should control of the Senate change hands as a result of the election, very little legislative activity would occur in the lame duck. However, even with Republicans winning control of the Senate, an effort is being made to act on at least two fronts, appropriations and taxes. Before adjourning, lawmakers approved legislation funding the government through December 11th. The legislation also contained other provisions including a nine month extension of the Export-Import Bank. As a result, the FAA has been operating since October 1st at funding levels below the increases recommended for the agency by the House and Senate Appropriations Committees. The expiration of government funding on December 11th was deliberately chosen by House and Senate appropriators to give them time to develop an “omnibus” spending package for the balance of the fiscal year. This omnibus bill would literally wrap all twelve spending bills into one massive piece of legislation. Should that occur, we expect the FAA will secure a funding increase that will also include bill language requiring funding of contract towers and prohibiting the development of unauthorized user fees. Of course, the biggest decision is whether or not to move such a package. At this writing it appears House Republicans are divided about whether to take up a full year spending package or extend government funding for a few months and revisit the issue in the new Congress. NATA has been serving as one of the leading members of a multi-industry coalition of supporters that includes the U.S. Chamber and the National Association of Manufacturers, in support of renewing a package of approximately 55 tax provisions that expired at the end of 2013. The “extenders” of particular interest to our industry are the immediate expensing of 50% of new investments in equipment and software commonly referred to as “bonus depreciation” and its small business counterpart known as Section 179 expensing. The House and Senate have approached the issue in different manners. The Senate Finance Committee approved a two-year extenders package that included bonus depreciation and Section 179. The full House approved a series of bills making certain extenders permanent changes in tax law, including both Bonus and Section 179. Similar to the appropriations situation, the fate of extenders remains fluid. While it is doubtful that the House approach will be fully accepted by the Senate Finance Committee, its chairman, Senator Ron Wyden (D-OR), has indicated his willingness to explore a mix of permanent and multi-year extenders. While a failure to act this year could make filing season very problematic, there is nevertheless an ongoing discussion about the advantages of acting on extenders retroactively in the new Congress. NATA and other coalition members are meeting with key members of the tax writing committees and the congressional leadership to coordinate efforts toward adoption of a permanent or multi-year extenders package. The House Transportation and Infrastructure Committee is taking advantage of the lame duck session to jump start its work on the FAA reauthorization. On Tuesday the 18th the full committee will hold a hearing entitled: “FAA Reauthorization: Issues in Modernizing and Operating the Nation’s Airspace.” In addition, the Senate Commerce Committee approved the nomination of Christopher Hart to serve as Chairman of the National Transportation Safety Board. Action by the full Senate is still required before adjournment.